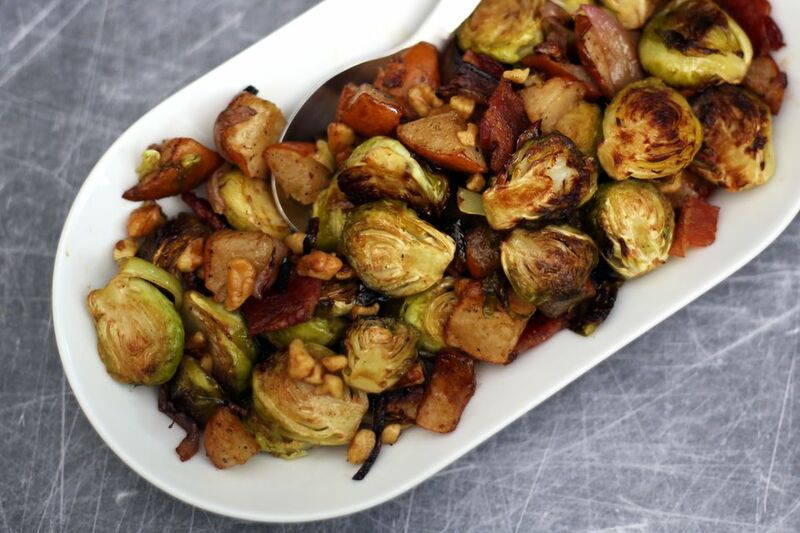 Nutritious Brussels sprouts and pears team up in this fabulous dish. Roasting brings out the wonderful sweet flavor of the Brussels sprouts while the pears and walnuts complement the sprouts beautifully. Walnuts are an excellent choice with the pears, but pecans, hazelnuts, or another type of nut would work as well. The bacon may be omitted if you prefer a vegetarian dish, or change it up a bit with diced cooked pancetta, Canadian bacon or diced ham. A rich, syrupy balsamic vinegar is the perfect finishing touch for this dish. A flavored balsamic vinegar like fig, pear or black walnut would be amazing. Drizzle as little or as much as you like over the roasted vegetables. Lightly brush a rimmed baking sheet with extra-virgin olive oil. Trim the stem ends of the Brussels sprouts. Remove loose outer leaves and any leaves. Cut the trimmed sprouts in half lengthwise. Core the pear and cut it into 1-inch pieces or wedges. There's no need to peel the pear. Slice the small onion or shallot, if using. In a large bowl, combine the sliced sprouts, pear and sliced onion or shallot. Drizzle with the 3 tablespoons of olive oil and toss to coat thoroughly. Spread the sprouts and pear mixture out on the prepared baking sheet and sprinkle lightly with kosher salt and a few grinds of pepper. Bake for about 30 to 40 minutes, or until the vegetables and pears are browned, turning about every 10 minutes. Meanwhile, toast the walnuts and cook the bacon. Place a dry skillet over medium heat. Add the chopped walnuts and cook until lightly browned and aromatic, stirring and turning frequently. Dice the bacon and cook in a skillet over medium heat until crisp. Remove the bacon to paper towels to drain. Set aside. Remove the Brussels sprouts to a serving bowl. Add the diced bacon and toasted walnuts and toss. Drizzle 1 teaspoon of balsamic vinegar over the sprouts and toss. Taste and add more balsamic vinegar, as desired. Serve hot. If you are starting with whole walnuts or halves, toast them before chopping. To chop, use a large, sharp chef's knife or mezzaluna. If you use a food processor, you could end up with nut butter. If you don't have balsamic vinegar, use 1 teaspoon of red wine or cider vinegar and combine it with 1 scant teaspoon of honey or maple syrup.